September 23, 2013: Death of Dr. Ruth Patrick.“Dr. Ruth Myrtle Patrick (born November 26, 1907) was a botanist and limnologist specializing in diatoms and freshwater ecology, who developed ways to measure the health of freshwater ecosystems and established a number of research facilities. Commentary:In 1974, I took a course on biological limnology from this amazing woman. She brought in luminaries such as Luna Leopoldnoted fluvial morphologist to give lectures as well as providing some of the most interesting classes herself. One anecdote that that was told to me while I was taking her class concerns some work she did during WWII. She was asked to identify organisms from scrapings on the hulls of German U-boats that had been captured. Her knowledge of diatoms was so encyclopedic that she pinpointed the location of the U-boat pens, which helped the Allies destroy them. September 23, 1986: New York Times headline–Settlement Averts Key Trial in Deaths Tied to Pollution. Eight families, who charged that water pollution by W. R. Grace & Company had resulted in the death from leukemia of five children and an adult, announced a settlement with the company today. Lawyers for each side refused to disclose the terms of the agreement except to say it was ”substantial.” The announcement came as the second stage in a complex trial was to begin in Federal District Court here this morning. The trial had attracted widespread attention because of belief that a jury finding might have set a national precedent holding polluters responsible for the medical consequences of their action. 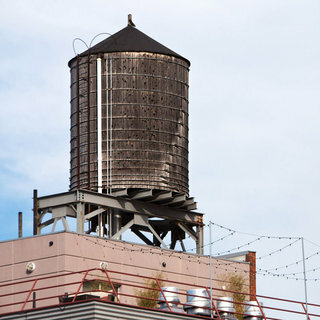 Commentary: I have always wondered who looks after the aging, wooden water tanks that dominate the rooftops in Manhattan. It is good to know that there are two family-run companies that do this. Now, if they could clean up the outsides of the tanks, it would make rooftop viewing all that more pleasant. This entry was posted in Year 7 TDIWH and tagged A Civil Action, botanist, diatoms, Dr. Ruth Patrick, drinking water, freshwater ecology, groundwater, leukemia, limnologist, Luna Leopold, Massachusetts, New York City, trial, water, water tanks, Woburn on September 23, 2018 by safedrinkingwaterdotcom. September 23, 2013: Death of Dr. Ruth Patrick. “Dr. 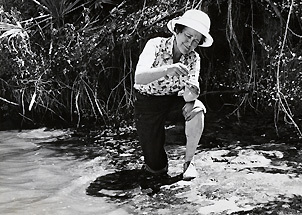 Ruth Myrtle Patrick (born November 26, 1907) was a botanist and limnologist specializing in diatoms and freshwater ecology, who developed ways to measure the health of freshwater ecosystems and established a number of research facilities. Commentary: In 1974, I took a course on biological limnology from this amazing woman. She brought in luminaries such as Luna Leopold noted fluvial morphologist to give lectures as well as providing some of the most interesting classes herself. One anecdote that that was told to me while I was taking her class concerns some work she did during WWII. She was asked to identify organisms from scrapings on the hulls of German U-boats that had been captured. Her knowledge of diatoms was so encyclopedic that she pinpointed the location of the U-boat pens, which helped the Allies destroy them. This entry was posted in Year 6 TDIWH and tagged A Civil Action, botanist, diatoms, Dr. Ruth Patrick, drinking water, freshwater ecology, groundwater, leukemia, limnologist, Luna Leopold, Massachusetts, New York City, trial, water, water tanks, Woburn on September 23, 2017 by safedrinkingwaterdotcom. This entry was posted in Year 5 TDIWH and tagged A Civil Action, botanist, diatoms, Dr. Ruth Patrick, drinking water, freshwater ecology, groundwater, leukemia, limnologist, Luna Leopold, Massachusetts, New York City, trial, water, water tanks, Woburn on September 23, 2016 by safedrinkingwaterdotcom. This entry was posted in Year 4 TDIWH and tagged A Civil Action, botanist, diatoms, Dr. Ruth Patrick, drinking water, freshwater ecology, groundwater, leukemia, limnologist, Luna Leopold, Massachusetts, New York City, trial, water, water tanks, Woburn on September 23, 2015 by safedrinkingwaterdotcom. 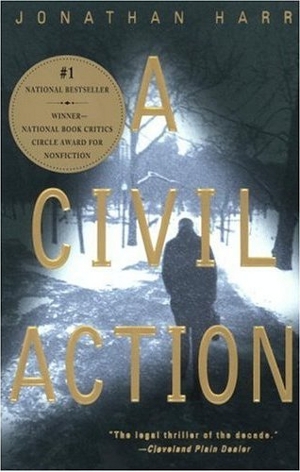 This entry was posted in Year 3 TDIWH and tagged A Civil Action, botanist, diatoms, Dr. Ruth Patrick, drinking water, freshwater ecology, groundwater, leukemia, limnologist, Luna Leopold, Massachusetts, New York City, trial, water, water tanks, Woburn on September 23, 2014 by safedrinkingwaterdotcom. November 26, 1907: Birth of Ruth Patrick. “Dr. 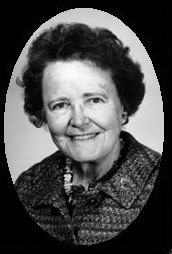 Ruth Myrtle Patrick (November 26, 1907 – September 23, 2013) was a botanist and limnologist specializing in diatoms and freshwater ecology, who developed ways to measure the health of freshwater ecosystems and established a number of research facilities. This entry was posted in Year 2 This Day in Water History and tagged botanist, diatoms, Dr. Ruth Patrick, freshwater ecology, limnologist, Luna Leopold on November 26, 2013 by safedrinkingwaterdotcom. This entry was posted in Year 2 This Day in Water History and tagged A Civil Action, botanist, diatoms, Dr. Ruth Patrick, drinking water, freshwater ecology, groundwater, leukemia, limnologist, Luna Leopold, Massachusetts, New York City, trial, water, water tanks, Woburn on September 23, 2013 by safedrinkingwaterdotcom.